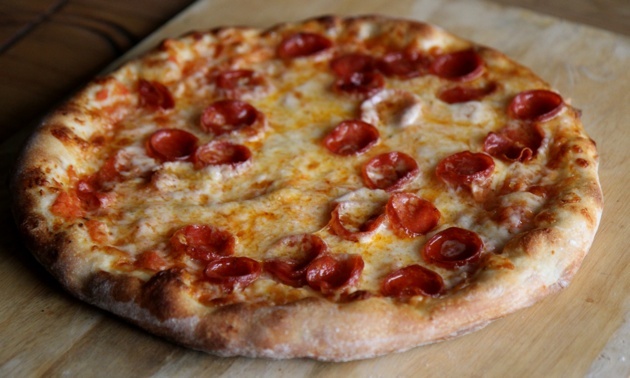 What do you think when you think of pizza? I'm sure the delightful, scrumptious words of melted cheese, spicy pepperoni, sauted mushrooms, seasoned sausage, browned peppers, caramelized onions, and don't forget baked olives come to your mind. How many of you, though, thought dessert when I said pizza? Pizza is one with many hats. It’s not restricted to the savory toppings we so often use. Dessert pizza is another revolutionized form of one of the most basic dishes. Dessert pizzas are, I would say, just so scrumptious! There's a restaurant I know of (and go to wait too often!) that has dessert pizzas such as raspberry strudel, peach, cinnamon sticks, Oreo pizza, and the cookie dough pizza. Oh my goodness, they are so amazing. And I'm not even saying that these are on a cookie. These are all made on regular dough. And they are still sweet enough! 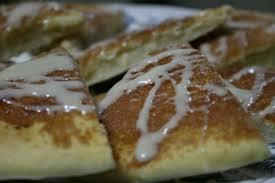 Today, I am going to focus on a cinnamon dessert pizza, made with a regular dough (but a really good regular dough). It's just so easy and just so good I can't help but sharing. It takes some time planning in advance because the dough is a little bit more intense, but it can be easily substituted with any other dough you like. This one is just particularly good. Really, once you have the dough, you just make that cinnamon topping and add some old fashioned canned frosting (which, if you choose the right one is actually really, really good!) Then you have a dessert to go with your pizza dinner without any extra hassle. As a side note, you should know the dough in the cinnamon sticks recipe can be used with any pizza you are trying to make. It’s versatile. There is another hat that pizza wears that has nothing to do with toppings; it’s all about tradition. Pizza makes us happy, it brings friends and family together. We have it at parties or games, at home or abroad. Pizza brings people together in a fun way. My family has a tradition; every Christmas Eve night we have homemade pizza (yes, the cinnamon sticks are definitely included). And don’t worry, we have the pizza buffet on many other occasions as well, especially for people’s birthdays. Whenever we get around the table eating of the goodness, we’re sharing stories, laughing, loving, and of course gobbling all flavors. Maybe pizza isn’t your thing. But I’m sure there are foods you know of that ring tradition in your ears. If you don’t have any traditions (whether it involves food or not), I encourage you to start some! It is never too late. The thing about traditions is that they bring people together. If gives them something to look forward to. It gives them and you enjoyment and closeness. P.S. If the cookie dough pizza intrigued you, it did me, keep an eye out for an article from Camille Hoffmann. The cookie dough pizza is my favorite dessert pizza hands down. Mix cinnamon sugar mixture ingredients together, set aside. Combine water, sugar and yeast. Set aside. Mix flour, bread flour, and salt together. Set aside. Once the yeast is foamy add extra virgin olive oil to the yeast mixture. Place dough in lightly oiled bowl and let rise until doubled (about 1 hour). Punch down the dough and shape into 2-3 balls (depending on how thick you want them). Wrap each ball in oiled plastic wrap and place back in the oiled bowl. Let rise until doubled (about 1 hour). Punch down and press each piece of dough into a lightly oiled pan. 15X10 or 11X 17 works well. Cover prepared dough with butter (I use about 1/3 cup per pan). Sprinkle with cinnamon sugar mixture. Bake for about 5 minutes. Watch closely. Remove from oven and drizzle with a generous amount of frosting. (microwave the frosting so that it is the right consistency to drizzle ). Betty Crocker buttercream frosting has a great taste with the cinnamon sugar. I recommend that.